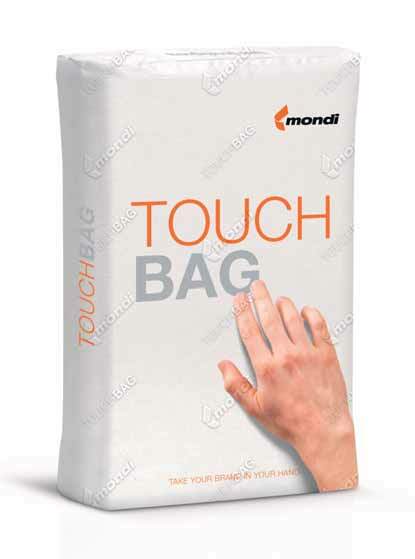 Under the slogan ‘Take your brand in your hand’, Mondi has launched the Touch Bag — an industrial paper bag with an embossed element such as a logo or another visual. The embossed element not only draws attention to the brand; it also gives the packaging an emotional touch and presents an obstacle to product counterfeiters. “We are excited to offer this new feature to our customers,” says Thomas Ott, Chief Operational Officer Mondi Industrial Bags. “Fillers can now further reinforce their brand on the packaging, and not only convey it in print but also through an emotional touch,” he adds. Embossing is a technique for creating a raised pattern on material such as paper, metal or wood. To produce the Touch Bag, sack kraft paper is run between a backing roll and an embossing drum with a pattern defined by the customer. The high pressure applied by the drums creates the raised element, which has a unique look and feel that customers are sure to find memorable. By combining the visual appeal of print with the tactile experience of embossing, the Touch Bag ensures that the customer brand lingers in the end customers’ minds. Customers can give their brand the importance it deserves with the Touch Bag. Branding works well when it works on the emotions. The Touch Bag’s embossing uses the power of the haptic to create positive associations with a customer brand. In today’s markets, there is strong competition in all fields. In order to be successful, fillers have to focus on their own customers’ benefits and differentiate themselves from other suppliers by offering a service that is not only exclusive, but sought after by a specific group of consumers. Packaging can underline this differentiation very strongly. The Touch Bag works with the customer brand and reinforces its image. A company that is proud of its brand shows it in every way possible — for example by letting it stand out on the packaging. Product piracy is a growing challenge in many markets. Counterfeiters who hijack a valuable brand create risks for unwary customers and jeopardize the integrity of the brand. “Consumers are led to believe that they buy a high-quality product, but in reality they risk being harmed by the inferior quality of a counterfeited product. The more sophisticated the packaging of each product, the more difficult it will be to fake,” states Thomas Ott. The methods used to produce the Touch Bag are sophisticated, making it significantly more difficult for counterfeiters to gain the upper hand. Mondi Industrial Bags, a business segment of Mondi’s Europe & International Division, is the leading international producer of industrial paper bags1, selling around 4 billion bags per year. Thanks to its broad range of bag specifications, Mondi Industrial Bags serves major industries including cement and building materials, chemicals, food, feed and seed. The business segment operates a dense sales and service network, the specialized filling equipment department Natro Tech, as well as its Bag Application Centre, where researchers develop and test innovative packaging solutions. Mondi is an international packaging and paper Group, employing around 24,000 people in production facilities across 30 countries. In 2013, Mondi had revenues of €6.5 billion and a ROCE of 15.3%. The Group’'s key operations are located in central Europe, Russia, the Americas and South Africa. The Mondi Group is fully integrated across the packaging and paper value chain — from the management of its own forests and the production of pulp and paper (packaging paper and uncoated fine paper), to the conversion of packaging paper into corrugated packaging, industrial bags, extrusion coatings and release liner. Mondi is also a supplier of innovative consumer packaging solutions, advanced films and hygiene products components.